The Olympus FE-310 (announced 22 January 2008) is an 8 megapixel point and shoot digital camera with a 5x optical zoom lens (37mm – 185mm equivalent) and 2.5 inch LCD. The FE 310 features Face Detection, dual image stabilization and Olympus’s ‘Perfect Shot Preview’, 17 shooting modes and allows you to record AVI movies with sound. 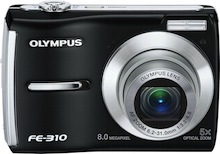 The Olympus FE-310 will have a retail price of $149.99 USD.